Commercial flight to Bettles, Alaska on Air Alaska and Wright Air Service. Brooks Range Aviation can fly you on a float plane to Hunt Fork Lake in the Brooks Mountain Range if you want to avoid the 56.3-km of continuous Class III rapids between Anaktuvuk Pass and Hunt Fork Lake. Wright Air Service has commercial flights to Anaktuvuk Pass if you want a more challenging paddle. There are three distinct paddling segments on the John River. 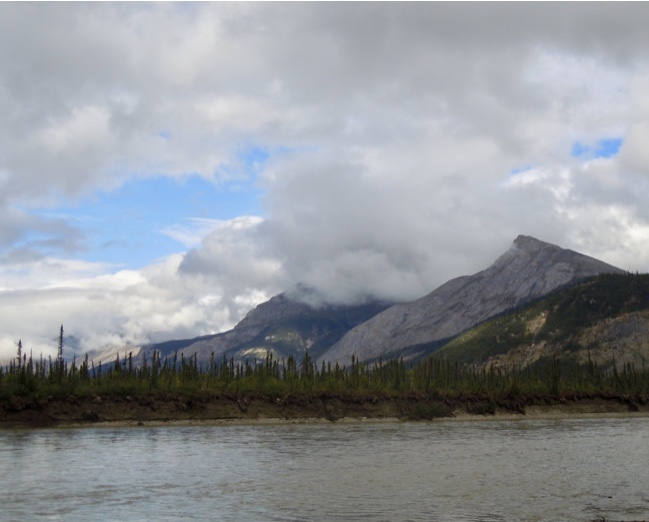 The headwaters can be an arduous challenge which requires the dragging of canoes down a small creek out of Anaktuvuk Pass for up to 5-miles to where it becomes a swift continuous Class III rapid for 35-miles. Below this, the middle section of the river is rated Class II for the next 47-miles then it is Class I on the lower reaches all the way to the mouth where it empties into the Koyukuk River just above Old Bettles. 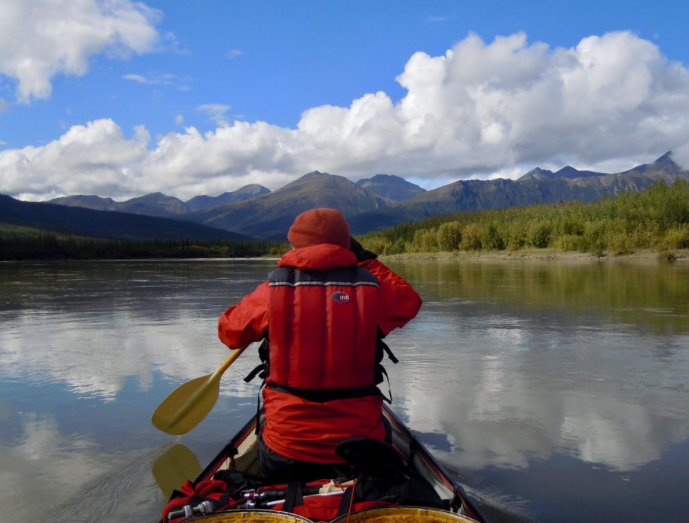 Returning to Bettles can be accomplished by tracking the canoe up the Koyukuk River. 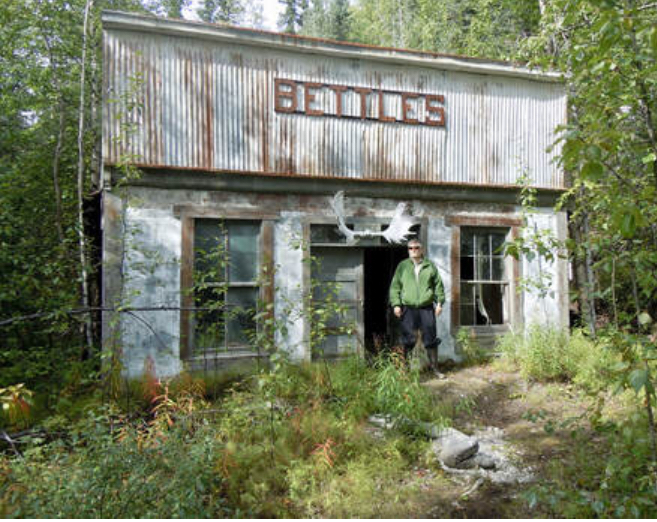 It is five miles from the confluence of the John and Koyukuk Rivers to Bettles or seven miles distance from the ghost town of Old Bettles. Arrangements can also be made to be picked up in Old Bettles. Brooks Range Aviation will pick you up by floatplane and Bettles Lodge will pick you up by jet boat for about the same price. However, you must call by satellite phone and already be in Old Bettles when you make the call for pickup. They will not come and get you on an agreed upon date and time. The weather is challenging and unpredictable. After gathering and repacking our gear for our flight we patiently wait for the mist and rain to stop. We wait for calmer winds and pray that the oncoming snow storm fails to deliver the revise prediction of six to eight inches of snow at Anaktuvuk Pass. Hunt Fork Lake is situated where two mountain passes come together and create turbulent winds. Short take offs sometimes are impossible and strand the pilot on the lake. Late in the afternoon we get word that all is go. Our original plan is to camp at Hunt Fork Lake; however, the ground is pockmark with dry tussocks and without shelter from the incessant howling wind. Instead, we decide to look for a portage. The river is approximately two hundred meters away and we are unsure which leg of the fork is easiest to reach. We parallel the shoreline moving towards a clump of small bushes and find a moose trail that easily takes us southward to an overflow area of gravel, sand and sparse vegetation. We cross a wide open divide of sand and find pockets of willows growing along a side channel of Hunt Fork. Here is were we will camp for tonight. We have protection from wind and a source of water nearby. Distance traveled, 0.6-km. I awake at 7:00 am. and it sounds like rain. I exit the tent. Mist fills the air and accumulates on the leaves and branches of the willows that sheltered my tent from last night’s winds. Thankfully, it is not true rain I heard. After a breakfast of cold granola and hot coffee, we carry the unassembled PakCanoe in a duffle bag to a small brushy clearing beside the overflow from Hunt Fork. Three quarters into assembling the canoe I get a whiff of something extremely musky. The odor is strong and nearby. I immediately grab my bear spray and yell, "Hey bear." Mike promptly joins in and echoes my shout. Five minutes have not even elapsed when Mike smells its first, grabs his bear spray and starts yelling, "Hey bear, hey bear." Quickly we resume our defensive posture not knowing if the grizzly has returned, circled back or if the wind just shifted. Several hours later we have our second grizzly bear encounter for the day. At one hundred fifty yards we get the grizzly's attention. He turns, eyes upon us, and slowly walks our way. This is not how it is supposed to work. Doing 7.5 mph, we rapidly close the gap on this flooded river. One hundred yards out, he continues his slow approach. I steer us to the opposite bank. We step out at forty yards and he turns and rapidly runs into the willow thickets. We stop at 4:00 pm to set up camp. Distance traveled, 17.8-km. Predawn, the wind roars shaking the tent, a storm without rain. I am out of my sleeping bag and breaking camp shortly after the first dim blue light. I exit the tent. The tarp is down and wrapped in a tangled web of cordage. The foot high stack of stones I placed at the water’s edge last night is nowhere to be found. I can only guesstimate how much, at least a foot and possibly two. The John is flowing fast at twelve kilometers per hour. The waves are large and an occasional sweeper leans out from the eroded or undercut bank. Mike watches the grayish silt laden water for small bouncing or quivering twigs indicating fast flowing shallow water with the potential for a submerged log or bush capable of rolling us with a sideswipe. All morning long the river circles back, one “S” turn after another. The weather is stereotypical. Rain and mist, repeat and repeat again. Throw in a minute or two of sunshine, fog or simultaneous sun and rain and repeat the cycle all over again. Every ten minutes the weather changes. The wind howls and whistles as it passes over the gear tied into the canoe. The gusts make it difficult setting up the runs and try to broach the canoe onto a rock or push the bow into a sweeper. Sleet intermixes with rain. The weather calms and stops blowing late in the afternoon. The sky is blue and without a cloud. We dine free of rain but as evening draws to a close the pitter patter of drops grow louder as we sit beneath the tarp and stare into the flames of a small fire. Distance traveled, 34.2-km. The tent fly is heavily laden with water from the all night rain. We consume breakfast beneath the tarp, protected from the drizzle, and watch the fog swirl and shroud the nearby mountain tops. After breakfast the rain stops and it quickly warms up. Soon enough, the weather changes. The clouds return and we slip back into our fleece. Mist, then rain, blue skies; we see it all. We paddle out of the Endicott Mountains into a broad low lying plain of meandering oxbows. The river is quite silty and hides the numerous partially submerged points and gravel bars. The valley continues to widen and flatten. Gravel bars become fewer and farther between, rising hardly an inch or two above the river. Every night the river rose between three to six inches and over a foot at one point early in our trip. The potential for flooding concerns us and the danger of a nighttime inundation worries us. It is getting late when we spy a low lying gravel bar with a high grassy bank. We consult the topographical map and see that we are near the section where we will be paddling braided channels for several kilometers. This area is prone to flooding. I retrieve the hatchet and together we climb the five foot high embankment and turn the small clearing into a campsite sufficiently large enough for two tents. Not quite asleep, I hear a large splash proceeded by a series of smaller splashes as if something is running at river’s edge. I unzipped the rainfly and find nothing noteworthy. Distance traveled, 45.3-km. The temperature drops. It is a cold night. We awake to a gray, cloudy 48℉ morning Our gravel bar is flooded. During the night the river rose three inches. Only a spit of land remains exposed and is it cutoff from shore by ankle deep water. The morning is sunless and once on the river it begins to mist then sprinkle. The weather changes every five minutes, sometimes raining hard and sometimes not. At one point of time, sleet was intermixed with rain. It is a very gloomy day and feels downright cold whenever it rains hard. The river is up and most of the gravel bars lie below the surface or are nearly washed out. We paddle onward and eventually spot a gravel bar that is high and dry and abruptly drops off into the river. It is dotted with large clumps of bushes. And where openings large enough for the placement of multiple tents exist, the shore is heavily scarred from the winter’s ice that bulldozed and carved out sand and gravel. Large mounds of cobble and partial water-filled craters pockmark the shoreline. Straight lines of rock and furrows crisscross the gravel bar from the blocks of ice plowing and pushing their way downstream. Debris riddles the shoreline. Level ground is not to be found to set a tent upon. The point is covered in bear and wolf tracks. Tracks are everywhere and appear to follow each other. They are inescapable. Mike shouts out, “Over there, a moose.” I do not see it. He points and clarifies that there is a moose in the water. “Do you see its skull and antler?” I question if this is the reason for so many tracks. The weather worsens and the alternating mist and rain turns into one continuous downpour. Rain pelts our faces. Sleet bounces off our hoods. We paddle to stay warm. We find a gravel bar rising three feet above the water and make camp beneath sunny blue skies. It is a nice campsite, very inviting and homy. And finally, the tents have enough time to throughly dry out. Another tree floats by. Clouds roll in bringing a chill in the air with their arrival. A flying diamond tarp configuration is pitched between bushes and provides just enough protection to shield us from the building cold breeze as we dine. Distance traveled, 36.3-km. I take several GPS readings as we near the mouth of the John River. The landscape reminds me of our most recent trip in Northern Manitoba. It is low lying, relatively flat with the Alatna Hills rising far off in the distance. Spruce, popular and birch line the cut banks along this gentle meandering floodplain reach. It is a monotonous view without the mountains to gaze upon. The wind is light and for once it does not rain. We arrive at the sandy delta where the flow of the John River merges into the swifter current of the Koyukuk River whose waters are a shade or two lighter than the brown water of the John. Old Bettles lies one mile further downstream. As fast as the Koyukuk is flowing, it will be a short paddle. We are reluctant to enter the main flow out of fear of passing the ghost town by. I scan the forrest’s green foliage and behind us at the base of the bluff I get a glimpse of a sign in the greenery’s window of a dilapidated store front building. It reads, “Bettles.” We tie the canoe to the log beside two badly bent propeller blades from a float plane. We take a well trodden path to explore the abandon settlement. Several buildings have sunk into the ground, slowly being swallowed whole by the melting permafrost beneath them. Other buildings stand at odd angles from the warming tundra giving way beneath their weight. There is no boat traffic and the quietness of the wilderness is shattered by the drone of planes coming and going. However, we are off the flight path and cannot be seen. We discuss how likely we can successfully track upstream to Bettles Field. It is questionable. Distance traveled, 22-km. The river is obviously flooded and flowing fast. Less debris is passing by. The only way out is for us to paddle and track unaided, alone without any interference from the outside world. I walk over to our makeshift river gauge and see that the river dropped six inches overnight. I give ourselves an 80% chance of leaving versus last night's 50% likelihood. We easily ferry three-quarters across the river before we feel the river's tug. Little ground is lost as we reach the opposite shoreline. We track upriver and ferry across where the gravel stops. With each crossing it becomes more and more difficult to make it across the last remaining feet and it is here where the current wins and we lose our lateral momentum and slide backwards. We lose track of how many crossings we make, maybe it is twelve possibly more but definitely not five as we were told. We drift backwards and catch a submerged gravel bar that almost rolls us. Soon thereafter, we lose too much ground ferrying across and completely miss the gravel bar. We pin the canoe against the nearly vertical shoreline and climb into the brush. We are tiring and take the path of least resistance behind a series of deadheads. Mike steps out of the canoe and into some quicksand. We ferry right and come to a standstill ten feet from shore. The current is swift and pulls us backwards. We dig harder using our leg and back muscle to pull more water. The power stroke is failing us. We are rapidly fatiguing and going nowhere, paddling for our lives. A sweeper awaits to knock us out of the canoe fifteen feet behind us should we drift backwards. We are in a precarious, dangerous predicament. I yell at Mike to go river center. He disobeys my command. He is reluctant to do so because he realizes we will lose ground and most likely have to start our run all over again. I yell at him again, "River center.” He reluctantly nudges the canoe left and miraculously we slowly pull forward and away from our demise. Onward, exhausted we round the bend and are seen tracking the canoe by the towns folks. They ready the jet boat for launching. We have fought the river. It is now personal, a matter of pride and accomplishment. I tell Mike, "I will be damned if they come and take me safely across the last thirty yards of this river." We hasten our pace and arrive at the end of the gravel bar and jump into the canoe before they can launch their boat. 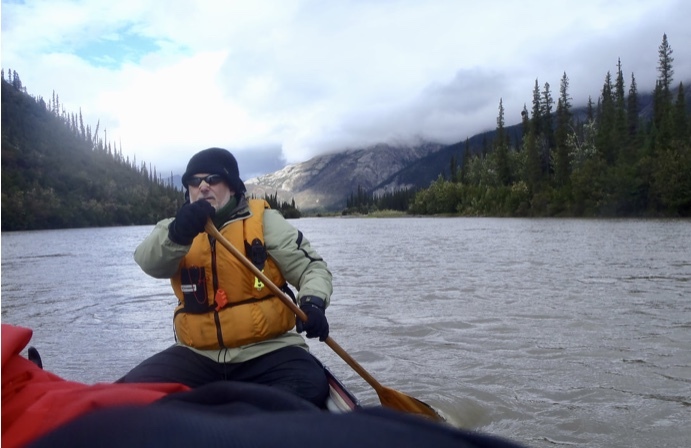 Halfway across we hit a submerged gravel bar and are forced to exit the canoe mid-river into a raging swift. We arrive at the hanger too tire to cook approximately nine hours after leaving the ghost town of Old Bettles. Supposedly, the trip takes two and one-half hours to track. 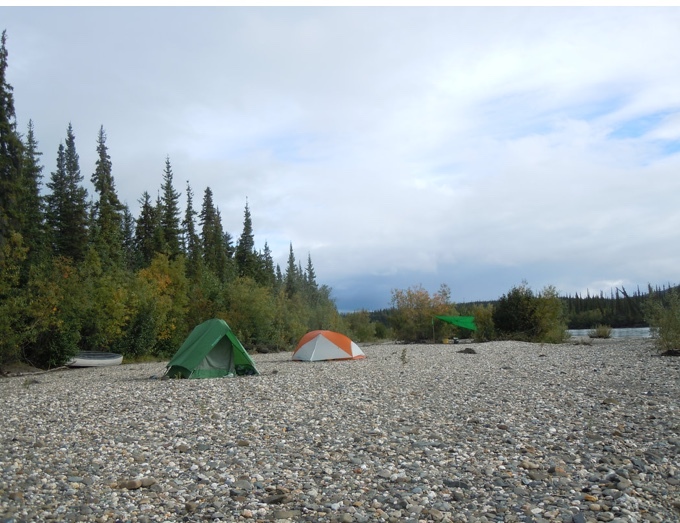 That evening while dining at Bettles Lodge we learn that no one really lines up the Koyukuk and especially not when it is flooded at four feet above ideal. Distance traveled, 9.1-km.